Sounding like a broken record or merely just a shoddy CD player made in China, I seem to chime the same tune over and over again. "A buffet is never the best option to experience good food". Really, it isn't; but I seem to visit one every now and then. Of course, some are done for blog purposes like Kisha Poppo and Sui Sha Ya. Others are just out of plain stupidity such as Kawawa. Then we have others that remind me of my childhood (see: Royal Fork and Uncle Willy's). Yup, none of the aforementioned restaurants are on anybody's culinary radar. Maybe for quantity only. 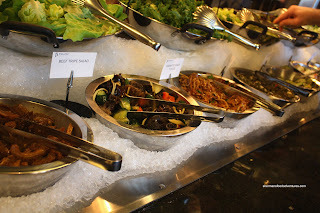 Even with tempered expectations, it is still very hard to "like" buffet f ood unless the ingredients are top quality such as seafood (especially served cold since it cannot further cook and become like rubber). 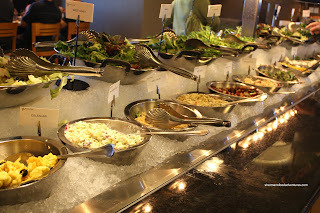 In the GVRD, we find very few of these types of buffets other than the Sunday brunch variety such as The Hotel Vancouver, Pan Pacific, Waterfront, Sutton Place and Metrotown Hilton. Yes, we can certainly get seafood at these places; yet at a cost of $30.00+. With that in mind, I finally made it out to The Buffet at the River Rock Casino. With so few non-Asian buffet options in the GVRD, we can now look to the casinos. Much like any other casino buffet, the layout of the restaurant is designed for that purpose. On an adjacent wall to the entrance, we find the Hot Food stations. 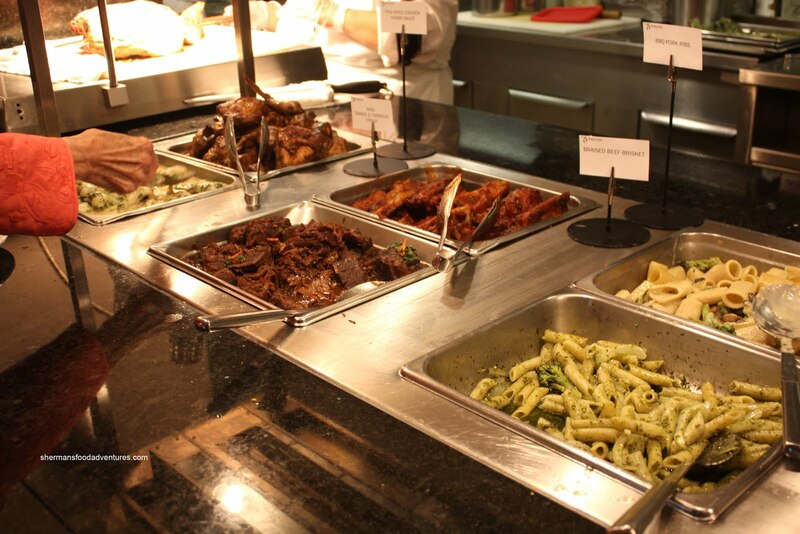 At the very start, there is a mix of items which included Candied Yams, Garlic Mash Potatoes, Corn on the Cob, Broccoli, Spaghetti with Meat Sauce, Shanghai Bok Choy, Pesto Penne, Rigatoni in a Cream Sauce, BBQ Ribs, 5-Spice Chicken, Braised Brisket and Basa with an Orange-Tarragon Cream. 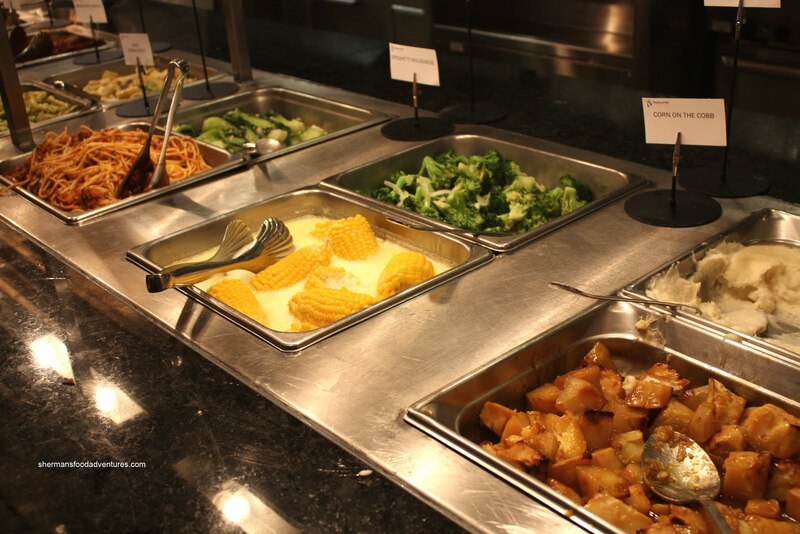 Believe it or not, the most memorable item from this section was the mashed potatoes. Yup, not exactly a ringing endorse ment of the food; but the potatoes were very creamy and garlicky. Predictably, the pastas were overcooked (sitting there in the sauce); yet the pesto was quite nice. Ribs were okay, quite tender while not really being all that BBQ'd. Brisket was not good, very dry and bland. Basa was decent, still moist and tender while the sauce was quite mild. 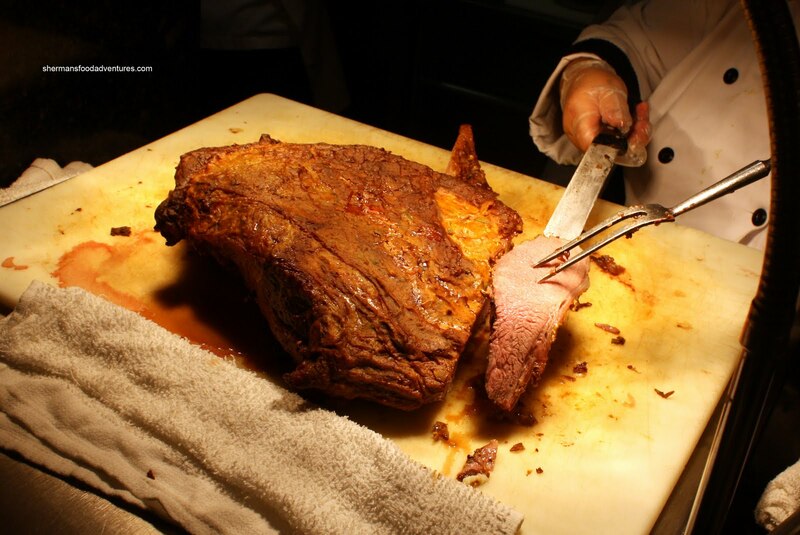 Directly after this selection of food came the Roast Beef. We found the beef to be quite chewy and lacking flavour. I guess we shouldn't expect a better cut of meat considering it was lunch? 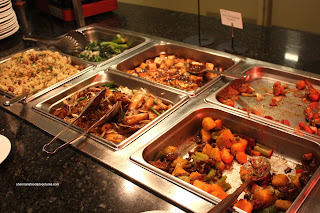 Since the River Rock is in Richmond, there was a large Chinese Food section. Too bad it really wasn't all that good though. There were 2 soups consisting of Hot 'n Sour and Cream of Corn. Both were forgettable. Then there were Potstickers, Steamed Chicken Legs, Spring Rolls, Sesame Balls, Stir-Fried Beef, Orange Chicken, Soy Rice Noodles, Ma-Poh Tofu, Fried Rice, Gai Lan and freshly made Onion Pancakes. Everything, as expected, was overcooked. Beef was tough, chicken was dry and veggies soft. 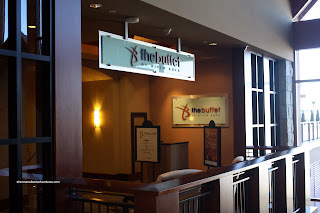 I guess we can't blame them since it is a buffet. But I've had better Chinese a t Panda Express. No joke! Reason being is the food we got here was both unappetizing to look at and poorly executed. When the thought of "I can do better than that" creeps in, then there is a problem. We skipped the Salad Bar and went for the hot food first. We returned later to discover the usual stuff. You know, Spring Mix, Potato Salad, Pasta Salad, Coleslaw, Bean Salad, Thai Noodle Salad, Pig's Ear... Pig's Ear?!?!? Yes, and add to that Seaweed Salad and Marinated Tripe too. Definitely a Chinese influence for sure. The rest of my table (who were non-Asian) stared at me in disgust as I gleefully chewed my tripe and pig's ear. I even dangled it in front of them to make my point. Yah I know, I'm immature... Anyways, all of the items in the salad bar seemed and tasted fresh. The Dessert section followed the theme of Chinese items integrated into more common sweets. Smack dab in the middle of it all is a Chocolate Fondue with various fruits and marshmallows. It was not really all that memorable since the chocolate was quite sweet and rather runny. Therefore, the chocolate never really adhered to the fruit. It looked more like fruit with chocolate sauce on the bottom of the plate. As for the other items, there was Bread Pudding, Cheesecake, Strawberry Flan, Cream Puffs, Various Petit Fours, Cheesecake, Creme Caramel, Apple Strudel, Chocolate Brownie, Lo Poh Beng, Cream Swirl Cake, Lychee Jelly, Moon Cake and Sticky Rice Balls with Red Bean. 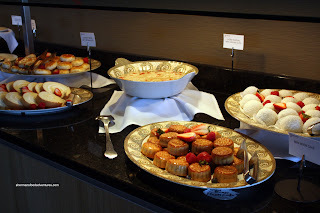 Okay desserts in general; but nothing extraordinary, which pretty much sums up this buffet. Mostly subpar with a few highlights. Certainly not worth $16.95; but okay when discounted (20% off for a group 10 or more). I had this place on my list for awhile now, but Richmond just have too many other good restaurants. But now seeing what they offer for $17, it doesn't seem to be worth the price compare with American buffets, I guess maybe I will just skip this and head to the states :P.
"We skipped the Salad Bar and went for the hot food first." Like a true Chinese buffet-er !! Jenny, it's worth trying just to get a sense of it all. But I really didn't enjoy it. Shokutsu... Just the mere thought of Kawawa scares me! LR, I am truly Chinese! AC, thanks for the confirmation. Too bad eh?